What do you do when you have a chronic or even crippling disease that you happened to get just because you inherited it? As little as three decades ago, you would have been stuck with the disease with no hope for a cure. Today, however, you might look forward to a new cure. The promise of fixing these genetic blunders of nature with one or a few treatments is close to becoming a reality. Since it was conceptualized in the 1970s, gene therapy has had its ups and downs. In 1990, it was first used to treat a patient. The patient, who suffered a genetic disorder called adenosine deaminase severe combined immunodeficiency (ADA-SCID), only experienced a temporary benefit. Subsequent clinical interventions, in the late 1990s and early 2000s, highlighted the risks of gene therapy. One patient in the United States died as a result of a gene therapy experiment meant to cure a form of liver disease, and several patients in France developed leukemia after they received gene therapy to resolve an immune deficiency. After these setbacks, clinical trials testing gene therapies started to decrease. At the same time, gene therapy was retooled. For example, it began to incorporate more effective vectors. Eventually, clinical trials picked up, and in 2012 the European Union issued its first gene therapy approval. Today, more than 2300 clinical trials using gene therapies are in progress, with over half of trials in Phase I. Finally, after decades of halting progress, gene therapy seems poised to realize its promise. Gene therapy involves replacing or compensating for a defective or mutant gene in one’s body by introducing “correct” DNA, effectively treating, and in many cases, curing disease. It promises to treat a wide range of diseases such as cystic fibrosis, heart disease (and its complications), diabetes, hemophilia, AIDS, and an ever-growing list of cancers. Several gene-therapy methods are being investigated. A mutated gene can be replaced so that it expresses a normal phenotype. It can also be “fixed”; that is, it can be turned off so that it no longer promotes disease. Conversely, a healthy gene can be turned on so that it may inhibit disease. In other cases, gene therapy allows the diseased cells to be more evident to the immune system, allowing for normal immune response. It should be noted that gene therapy is still in a very experimental phase. Although it may seem promising, it still poses serious risks. It is constantly being studied to instill confidence in its safety and efficacy. It is studied most intensively for its potential against diseases that aren’t treatable via traditional methods. Congestive heart failure (CHF) is the condition in which the heart’s blood pumping function is compromised and becomes inadequate to meet the body’s needs. Many factors can contribute to CHF, one of which is a downregulation of the adenylyl cyclase type 6 (AC6) protein found in heart muscle, causing a low ejection fraction in the left ventricle. CHF may be treated by a candidate therapy being developed by Renova Therapeutics. This therapy, called RT-100, has promise as “a single-dose treatment designed to safely improve heart function,” says Jack Reich, Ph.D., Renova’s CEO and cofounder. The therapy’s Ad5.hAC6 adenovirus vector effectively delivers the AC6 gene via cardiac catheterization (an outpatient procedure) directly into the arteries. This AC6 is then taken up by the heart, resulting in better myocyte function and improved calcium handling. Dr. Reich indicates that Renova has other products in its pipeline. RT-200, which delivers Urocortin 2, is designed to increase insulin sensitivity and glucose disposal. It could be used to treat several cardiovascular and metabolic diseases. RT-300 is meant to deliver the Urocortin 3 gene, to correct CHF with pulmonary hypertension. RT-400, a peptide infusion treatment with stresscopin hormone, is being evaluated for its ability to treat acute decompensated heart failure (ADHF). Renova Therapeutics has several gene and peptide therapies in development for sufferers of cardiovascular and metabolic diseases. 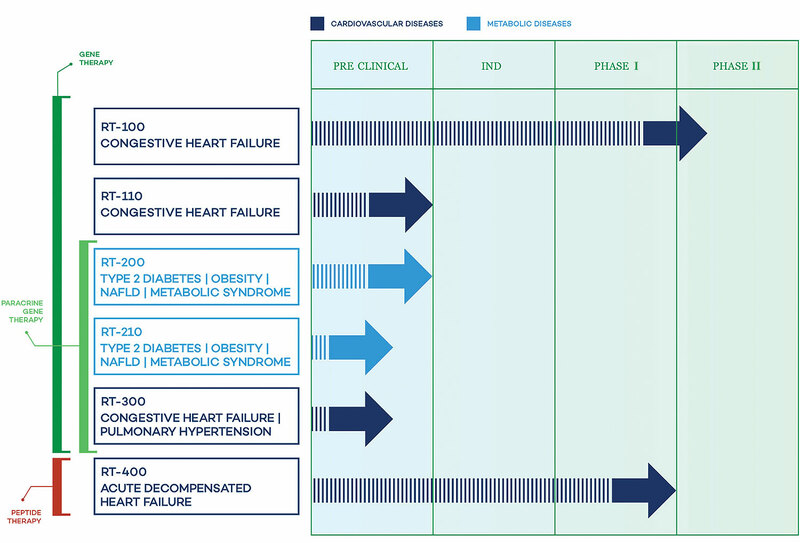 Farthest along the development pathway are RT-100, which delivers a gene to treat congestive heart failure, and RT-400, which is a peptide infusion therapy for the treatment of acute decompensated heart failure. NAFLD (non-alcoholic fatty liver disease). There are at least 7,000 different rare diseases that affect around 300 million people worldwide with around 200,000 cases in the United States alone. Several pharmaceutical and biotech companies are working tirelessly to find ways of curing or at least alleviating the distressing symptoms of these often-forgotten diseases. One such company is Audentes Therapeutics. It has four programs in its development pipeline that show promise in using gene therapy to correct and improve, or even cure, a few rare diseases. The company’s AT132 program is meant to treat X-linked myotubular myopathy (XLMTM), an extremely rare disease that affects approximately 1 in 50,000 newborn males worldwide and is characterized by severe muscle weakness and impaired respiratory function. Other programs at Audentes include AT342, which targets the UGT1A1 gene to treat Crigler-Najjar syndrome; AT307, which targets the CASQ2 gene to treat CASQ2-related catecholaminergic polymorphic ventricular tachycardia (CPVT); and AT982, which targets the GAA gene to upregulate an enzyme called acid alpha glucosidase for the treatment of Pompe disease. 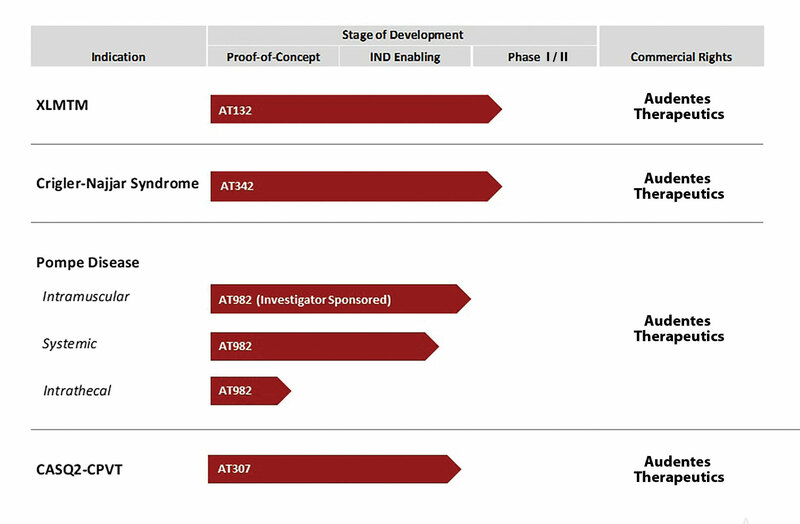 The Audentes Therapeutics portfolio consists of four programs, each of which applies adeno-associated virus gene therapy technology. Programs that are entering clinical-phase testing include AT132, a therapy for X-linked myotubular myopathy (XLMTM), and AT342, a therapy for Crigler-Najjar syndrome. Achromatopsia, a nonprogressive and hereditary retinal disorder, is characterized by decreased vision, increased photosensitivity, and a marked absence of color vision. It affects about 1 in every 33,000 people worldwide and can cause several grades of incomplete-to-complete color vision loss depending on the level of cone photoreceptor function. To develop a treatment for achromatopsia, Applied Genetic Technologies Corporation (AGTC) is working on AAV-based technology that could also be effective against disorders such as X-linked retinitis pigmentosa (XLRP), X-linked retinoschisis (XLRS), and wet age-related macular degeneration (wet-AMD). In certain cases, there could be multiple gene therapy product candidates, one or more for each of the genes that are associated with the disorder. Each of the gene therapies should be expected to have a unique potential effectiveness, dictated by the role that the gene plays in the visual process. ACHM is caused by mutations in any of at least six genes, and gene therapy product candidates are in clinical development for patients who have mutations in two of these genes (CNGA3 and CNGB3, which account for 75% of the patient population). Targeting cancer cells that have spread to several organs of the body is difficult. Targeted radiation therapy or chemotherapy tends to destroy not only the cancer cells but also normal cells. Turning to gene therapy to selectively deliver therapeutic genes into these cancer cells on a larger scale and eliminating them in one fell swoop is the ultimate goal of Tocagen. Using two products, Toca 511 and Toca FC, the company plans on developing an effective combination therapy that could hit the cancer hard. Toca 511 is an injectable retroviral replicating vector (RRV) that provides the genetic material to encode a prodrug activator enzyme, cytosine deaminase (CD), which is derived from yeast and has no human counterpart. It is selectively delivered to only cancer cells, thus producing the CD protein in each cell. Part two of this therapy involves a pill called Toca FC, which contains 5-fluorocytosine (5-FC) that converts to the anticancer agent 5-FU in the presence of CD protein. Toca FC kills not only the cancer cells, but also the myeloid-derived suppressor cells (MDSCs), which suppress the immune system, and tumor-associated macrophages (TAMs). Dr. Gruber also mentioned that Toca 511 and Toca FC received the FDA’s Breakthrough therapy designation, which expedites drug development. The field of gene therapy has come a long way since its inception. Early failures and setbacks forced researchers back to the drawing board to figure out how viral vectors could be accepted by the human body, which ordinarily rejects foreign particles. Researchers also had to learn how such vectors could reach specific targets and deliver foreign DNA that could be integrated into the genome. This dance between therapy and the innate immune system is getting more complex, but is also showing its true beauty within the complexity. Tocagen is developing Toca 511, an injectable vector that pro-vides a gene for an enzyme that can activate a 5-fluorocytosine (5-FC)-containing prodrug. Toca 511 selectively infects brain tumor cells, where 5-FC, an anticancer agent, is released. 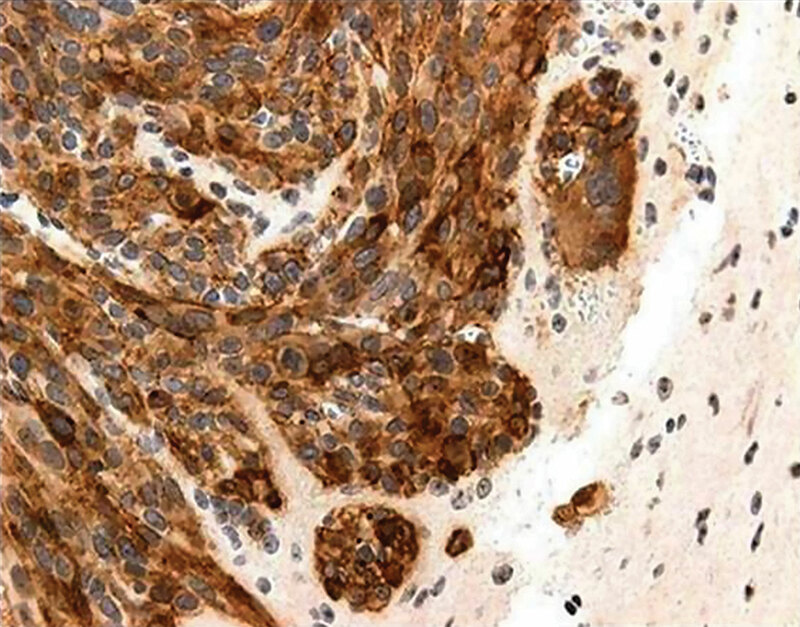 In this image, which shows a section of mouse brain, healthy and Toca-511-infected tumor cells appear in white and brown, respectively. CRISPR-based gene therapy involves repairing a disease-causing DNA mutation in the somatic cells of a patient. While there is great interest in this approach, one potential obstacle is how to test the efficacy of the proposed therapy in an effective manner. Ideally, a CRISPR/Cas9-based therapy not only must efficiently modify the target DNA sequence, but also needs to be delivered in the right tissue at the right amount and lack side effects. It is therefore desirable for researchers not only to evaluate the DNA repair efficiency of the therapy, but also to test delivery methods, dosing, and potential side effects/off-targets in different tissues. As opposed to other therapeutic approaches (such as kinase inhibitors), gene therapy acts on a biological feature—namely, a defined genomic sequence—that is highly species-specific and usually even patient-specific. Since non-genetically modified animal models such as mouse, rat, or monkey will likely not have the same target sequence in their genomes, they cannot be used to test the therapy. By introducing a human gene bearing the patient-specific mutation, model providers can create a model of human disease to test the efficacy of the gene therapy in vivo, continues Dr. Flora. “An example of this approach is reported in a Nature publication describing the application of such a model. While this model was used to test zinc finger nucleases, an alternative to CRISPR, it demonstrates the value of genomic humanization as a means to overcome the limitations of testing gene-editing therapies.